What springs to your mind as the sun shines and the beach looks exceptionally appealing? Probably, you’d love to go over there with friends, take some food with you, a couple of towels, some sun lotions, and… you’re out of hands. What does that mean? Why, that you need a new beach bag, of course! Technically, you could use a standard backpack or even a plastic bag. But I don’t think you would appreciate them. They are simply not meant for that. A beach bag it is, then. Where to get one? You will notice a whole variety of them on the internet, all different in size and color. On Amazon, you can also read the customer reviews. Positive feedback matters, after all. Some of the bags are so good that the only response customers can give is “Wow, it’s amazing!” Reassuring, but not exactly helpful. How to find out what beach bag is made just for you? Beach bags and totes are designed by many brands. STAR is mostly focused on striking colors; BRC Fashion often makes canvas zipper beach bags. As for oversized beach bags, you can easily get one from BeachMall and Fisher Finery. Very few manufacturers make embroidered beach bags. Unlike standard bags, they look like they are handmade and, sometimes, they are actually handmade. Be advised, low-quality embroidery prone to fading might mark your clothes. 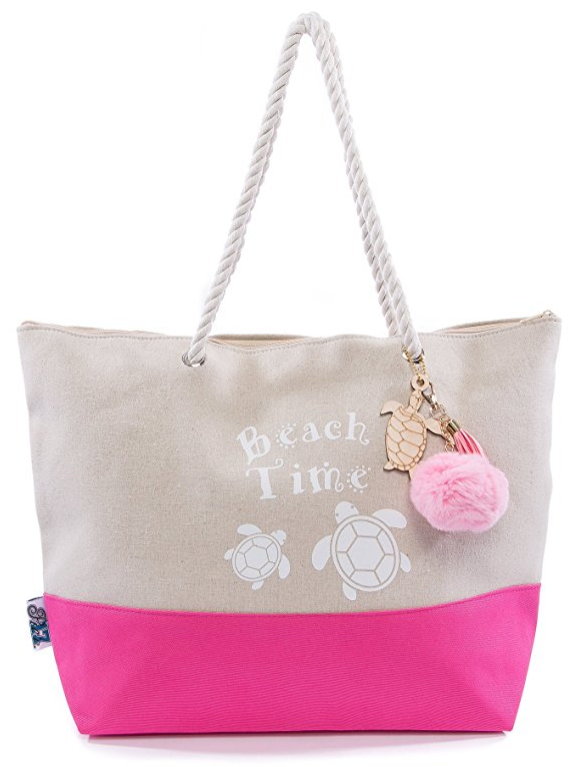 If you are a true fashion girl, a VICTORIA’s Secret beach tote bag will surely catch your attention. Eric Javits presented a gorgeous tote bag made of water repellent coated canvas. Materials beach bags are usually made from include polyester, canvas, mesh materials, and even straw. If you expect to fill your bag with big heavy items, choose thick quality canvas. Canvas is an extremely durable plain-woven fabric used for making tents and backpacks. If you get yourself a canvas beach bag, it will not wear out for a long time. Of course, that may be redundant. If you’re planning to put light necessaries there, a pair sunglasses, an iPhone and that’s it, polyester should suffice. As a rule, bags made from this material are bright and quite attractive. If you have a big family, you’ll definitely have to ponder over how to put almost half of your house into your bag. In that case, the best choice would be a roomy bag that can easily hold plenty of towels, snacks, kids’ toys, drinks. If you are a happy mom, that is the option for you. A young woman would hardly wish for a big beach bag. She’d rather dream of a cute and fashionable purse she could take not just to the beach but, for instance, to the pool. A tiny square bag will easily replace a school backpack. Some big bags are heavy even when empty, mostly because of their material. Polyester bags are less heavy compared to bags made of durable canvas. Thin materials dry faster. The more pockets and accessories the bag has the more it weighs. 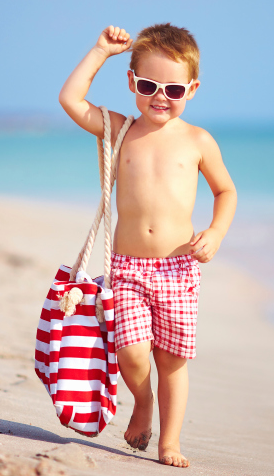 Do note that a beach bag for moms is not necessarily for the mom. A strong dad could and probably should carry it. 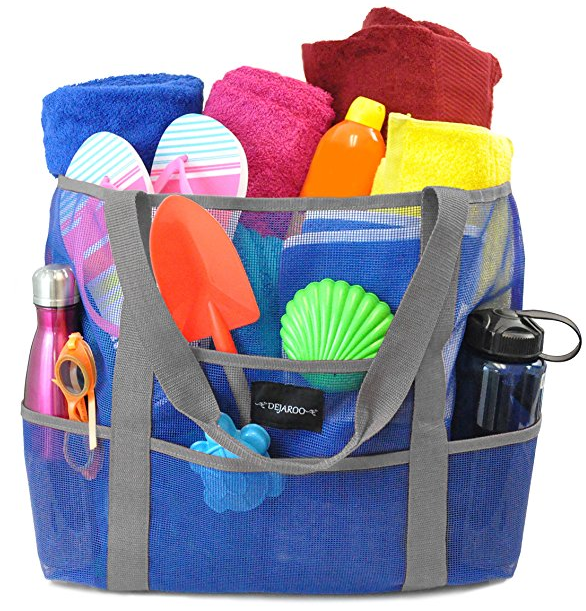 There are several important things to consider when buying a beach bag. Not the least of which is how waterproof the bag is or if it is waterproof at all. The Malibu Mesh beach bag is indeed waterproof, at least, partially so as it comes with a couple of waterproof compartments. But of course, that is not the most important feature the bag has. What really should sway your opinion in favor of this product is the fact it comes with a cooler compartment. It’s rather simple to use, just put there an ice pack or even a bottle of frozen water, and there you go. No needless sophistication, everything is straightforward and reliable. 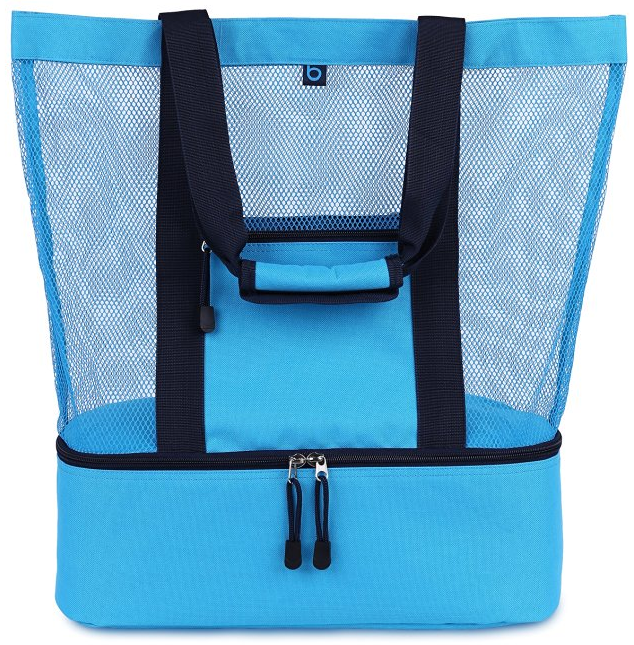 This bag is made of mesh, canvas, and plastic. Cheap and lightweight materials. The integrated cooler allows you to pack everything in this bag, eliminating the need for hauling around a separate cooler bag. Only use ice packs or bottle, the cooler compartment is not meant to be used with ice cubes. The bag has the following dimensions: 16″x 6.5″x 20″. Thanks to the mesh, you can even put wet towels and bathing suits in there. Click here to see the Pricing, Ratings, and Reviews on Amazon.com. Sometimes, the access to cold drink just doesn’t cut it. It’s nice to have something cold to drink, sure, but that’s hardly essential. There are things that matter more. One of them is the sheer number of pockets and compartments. After all, the primary purpose of any beach bag or, indeed, a bag, is to hold all the things you can’t carry in your hands. What’s even better? The ability to see as many of them as possible at the same time and to get them as quickly as possible. If that’s what you want from a beach bag, then the Dejaroo beach bag is exactly what you need. It is a rather large beach bag (17.5″L x 15″H x 9.5″W). It can easily accommodate a few big towels and lots of kids’ toys. It comes with eight big pockets, including a zipper pocket for keys, phones and sunglasses. The wide straps make it exceptionally comfortable to carry. Sand doesn’t stick to the bag – you could just shake it off. The bag dries out rather quickly. You can take this bag to the pool or even to grocery shopping. The mesh walls allow to find what you need in a blink. Many people like the beach. Some of them would love to go to the beach every single day, but unfortunately, they have no such opportunity. They can only leave for the beach from time to time. Which means they have every reason to doubt that a beach bag is worth buying as they would use it just several times a year. However, that is not necessarily the case. For instance, the Vera Tote Shoulder Bag is a rather good option for such people as they could take it not only to the beach. But also almost anywhere. Its size (15 x 0.8 x 20.9 inches) allows you to put a laptop or several books inside and take it to school. Or, have a good weekend for that matter. The zipper helps to secure your belongings. The bag is made of rooted canvas and has thick ropes for carrying in hands or over the shoulder. Moreover, this bag looks very lovely and trendy thanks to its print. By the way, there are plenty of prints (stripes, waves, elephants), so you can choose whatever print and color you like most. It’s very easy to care for it. When it gets dirty, use a soapy damp sponge first, then rub the spot gently and wipe it with another damp sponge. There are things that can inspire you even when the weather doesn’t allow you to go to the beach for a long time because of heavy rain and hopelessly leaden sky. 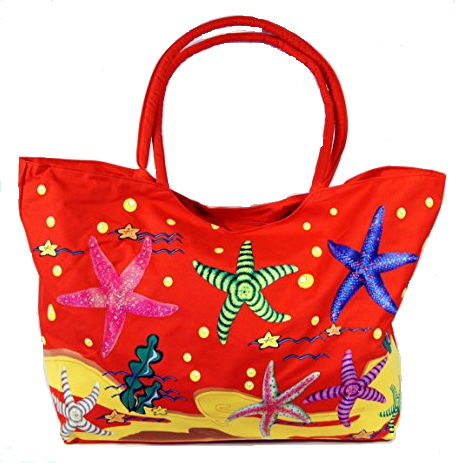 Just a glance at Waterproof Jumbo Red Canvas Beach Tote Bag, and you will remember about your favorite pastime. Life is good again, and the sun shines brightly in your heart. This bag comes in a wonderful tropical design. It is decorated with starfishes, palm trees, turtles, and almost makes you think that you have found yourself in the tropics. You will never forget this lovely beach bag anywhere thanks to its bright colors. Its dimensions are 24 X 15 X 6 inches, so it has enough room for your towels, sandals, swimsuits, drinks and snacks. The bag is made of durable canvas. It has a zipper pocket for valuables. The handles are well sewn. This bag has just one disadvantage: select few of them might smell funny. At the same time, it has a great advantage: it is waterproof. A tip: use a waterproof spray to apply to your bag to ensure the best waterproofing. It is most likely that a big family will choose an oversized beach bag. A rational person turns their attention on waterproof features, and a frugal one wants to have a bag for all occasions. Could a typical beach bag serve as a fashionable accessory? 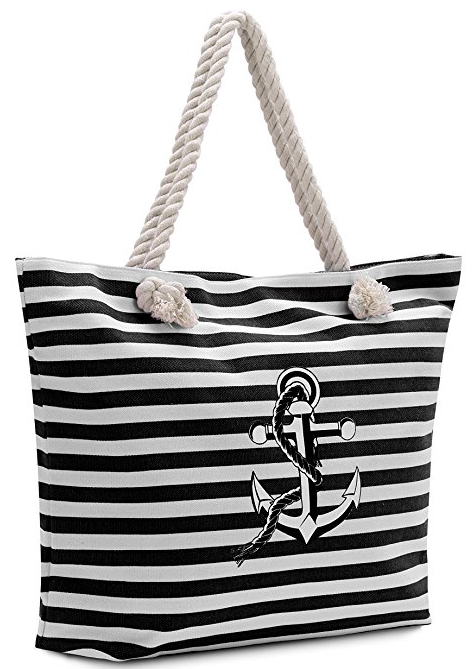 Of course, it could, especially when it comes to the Pier 17 Canvas Beach Bag. This pink colored bag is very cute. It is rather good for beach and travel. Moreover, you can carry it wherever you go. The bag’s dimensions are 20.5″x 15″x 1”. It can accommodate a plenty of belongings, so it is also suitable for shopping. The bag is extra light though it is made of a canvas of high quality. Besides, you can clean it easily using a washing machine. The rope handle is 12 inches long. It’s just the perfect length to carry over your shoulder. One more advantage is the zipper closure that prevents your stuff from falling out. However, it is its lovely pom pom that impresses the most.